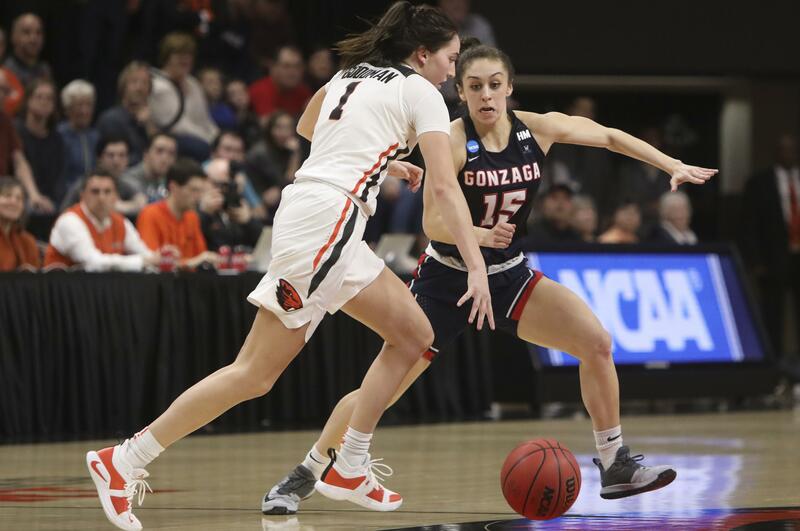 CORVALLIS, Oregon – Once again, Oregon State found a way – and the Gonzaga women are finding their way home after a remarkable season. In a game that wasn’t decided until the final minute, the Beavers made the big plays at the end to beat the Zags 76-70 in a second-round NCAA Tournament game Monday night at Gill Coliseum. “Against the really good teams, like Oregon State, you have just a limited number of mistakes that you can make and tonight we unfortunately made a few too many,” Fortier said. And to their credit, the Beavers (26-7) came through in crunch time to advance to the Albany, New York, regional against top seed Louisville. “You never take anything like this for granted,” said OSU coach Scott Rueck, whose Beavers survived an overtime game against Boise State on Saturday to reach the second round. Four years ago, the Zags won a second-round game on this very court by making the big plays in the final minutes, a tie game that GU ended up winning by 12. If there was a turning point in a game that Gonzaga led for more than 25 minutes, it came with 2 1/2 minutes left. GU guard Jessie Loera missed a long jumper, and 20 seconds later OSU guard Mikayla Pivec made the play of the game. Driving past LeeAnne Wirth, the junior from Lynnwood, Washington, got the layup and the free throw after the foul on Wirth. The crowd erupted in its loudest cheer of the night, and the Beavers never trailed again. GU got within one on a jumper from Chandler Smith, but OSU forward Taya Corosdale, who played all 40 minutes, drained a 3-pointer to make it 65-61. The Zags, who finished 3-for-13 shooting from long range, missed two more before Maddie Washington all but iced the game with a layup that made it 67-61. Gonzaga senior Zykera Rice, who finished with a game-high 20 points, also finished her career with a pair of 3-pointers, but the Zags never got closer than four points the rest of the way. “It was another fantastic day in Gill,” said Rueck, whose program is in the Sweet 16 for the fourth year in a row. Gonzaga led 16-15 after a rough-and-tumble first quarter. Rice picked up her second foul late in the period but the Wirth twins scored a pair of field goals each. GU struggled from the field in the first quarter, shooting 6 for 18, but OSU was even worse (4 of 16). Rice opened the scoring with a short jumper, but OSU reeled off the next five points before Lee Anne Wirth gave GU a 6-5 lead with a long jumper. Pivec answered with a wide-open 3-pointer in what became a fast-paced game that didn’t favor the Zags. GU led 22-18 midway through the second quarter, thanks to some aggressive defense that seemed to bother the Beavers. At that point OSU was 6 for 24 from the field. The Beavers didn’t do any better the rest of the half, and finished 10 for 30 from the floor. GU didn’t do much better – 15 for 34, and missed all four shots from outside. OSU guard Destiny Slocum came into the game averaging 15 points but was held to two in the first half. However, Slocum came alive in the third quarter, hitting a 3-pointer that cut the GU lead to one. She finished with 12 points, one of five Beavers in double figures. GU led 34-32 at halftime, but OSU tied the game on a layin by 6-foot-8 post Joanna Grymek that tied the score at 47 with 1:27 left in the third, and Fortier called timeout. Oregon State had a 42-34 edge on the glass, but Gonzaga forced 12 turnovers. The Zags also tied a season low in turnovers with six. Published: March 25, 2019, 10:58 p.m. Updated: March 25, 2019, 11:13 p.m.